I've had a bare wall in my dining room that needed a little decoration. I'd even picked up a blank canvas on sale that would fit the spot, I was just waiting for inspiration. Luckily, the inspiration came after seeing the beautiful Cherry Blossoms in bloom in Washington, DC this weekend. A little Spring-themed art would be perfect. A close up of one of the trees. Want to know the best part? The whole thing cost me $8. I'd picked up the 12x24" canvas on sale for $6 and the burlap for the background was $2 (plus I have leftovers). The fabric scraps for the trees and blossoms? I actually pulled those from a pile of clothes that were worn out and ready to be donated or trashed. Corduroys with worn out knees and some stretched-out long johns! 1. Trace your child's hand and part of their arm on the paper side of your iron-on adhesive. 2. Iron the Heat n Bond with the handprint onto the wrong side of your tree trunk fabric. Then cut out your tree trunks and set aside. 3. Cut out your burlap to be slightly larger than your canvas. You'll want it large enough to wrap around the sides and onto the back. 4. Wrap your burlap around the canvas. I put a small line of hot glue on the back edge of the canvas, pulled the burlap tight and pressed it onto the glue (using a spoon so the hot glue didn't seep through the holes in the fabric and burn!) I then folded over any excess burlap on the back and glued it down to finish the back a little more. Burlap wrapped canvas is ready to go! 5. Peel the paper backing off your handprints and iron them in place on the burlap. It actually worked quite well, I just put a potholder under the open part of the canvas to press up and make a more solid surface to press the iron down on. 6. Now, get to work cutting out your cherry blossoms. This was definitely the most tedious part, but you don't have to be exact. For the petals, I cut out some puffy, plus sign shapes and then smaller circles of the darker pink and white colors. 7. To make the blossoms, I used a squirt and smush technique. Squirt a bit of hot glue on the darker pink circle, then bunch up and smush on the white circle. Then, squirt a bit more of hot glue in the center of your petals, put your centers in place, then smush and pinch the back part to make your blossom three dimensional. 8. 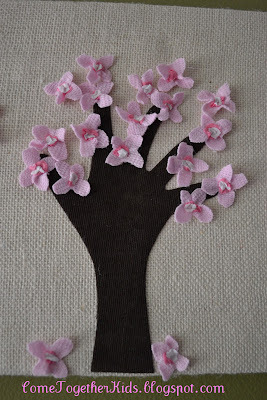 Begin hot gluing your blossoms onto your tree. Keep going until they are filled with the pretty blossoms. 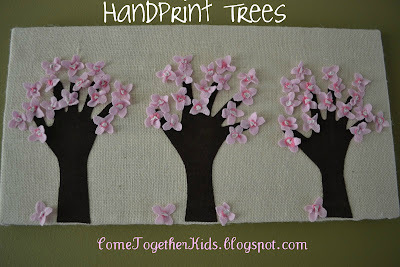 I made mine so the trees had a good amount of blossoms, but the handprints were still somewhat visible. 9. And you're finished! 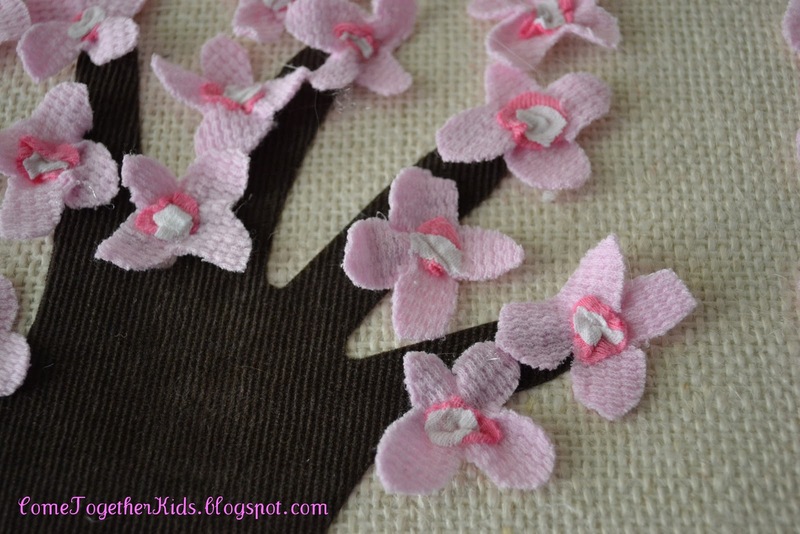 You have a pretty Spring wall hanging that captures your child's handprints from this year. What a cute Mother's Day gift this could make for the grandmas! Oh, and I'm totally going to use my leftover burlap to make a Fall wall hanging with Autumn leaves. super cute! what a easy decor item to display for spring too! This is such a great idea! I have everything except the canvas around the house already too, love that you reused worn out items! We will be mailing these to grandma and nana this year, thanks for the inspiration!! This is a lovely piece of wall art, I just love how you involved your children but as you say 'doesn't scream children'! Fantastic work. How cute! This would be a great Mother's day present! Think we'll make these for the Grandmas! Thanks for sharing! Laura! This is darling! You should come link up at Handmade Love Thursday on my blog. The linky is open until next Wednesday night. I am soooooooo going to have my four little ones do this. I love it! A beautiful treasure! Wonderful ideas on here. I can not wait to break out the hot glue gun and try some. What a great idea! Thanks for stopping by and linking, have a wonderful weekend! What a sweet idea! I did not realize it was a hand when I first saw it, how clever!! What a fantastic idea!! I absolutely love the pretty little blossoms! Thanks so much for sharing - I can't wait to make these for Mother's Day Grandma gifts! I have a bag of clothing scraps I keep for things like this. Thanks again (and always) for the inspiration. oh man! I love this. you are so creative. what a great idea. This is absolutely adorable! My favorite part is that you used what you had (tights & old jeans). So sweet and lovely! Thanks for sharing at Beyond The Picket Fence. Ok I totally love this!! I plan on making one today and I will feature you this week on my blog http://bestpartofbelieveis.blogspot.com. I will e-mail or post to you when I have it done. Extremely cute! Wow, I wish I could think of things that crafty and awesome off the cuff from looking at something as simple as a tree! Love it ! What a great idea ! I love this--so sweet!! anything with my kids hands is a treasure!! we are your newest followers and are visiting from http://holidaysnobs.blogspot.com/ we would love to feature you if you have a mothers day creation!! Let us know!! I'm a new follower. This is so cute. I live just outside of DC so this is a great idea. This is so adorable and I really want to make one! I love your projects. p.s thanks for linking up to my craft challenge. This is SO great! :) I love that you involved your kids in the project! It really is an adorable canvas! Thanks for sharing! That is so great! I LOVE that you use each of the children's hands for the trees. What an awesome idea! I so love this - I am going to do one for my RV - wall space is a huge issue along with weight and wow - this would so work for us. LOVE THIS!! This is so so adorable. It would be so cute in a little girls room! I would love for you to come link up to my Sew Crafty Party ! I really love this. When we moved into our house, we had two cherry trees in our backyard and I fell in love with them. In fact, I have no window dressings in my kitchen, just to see the gorgeous blooms. One tree has since been chopped down, but the other remains. I am definitely going to make this project with my children this week and hang it in my bedroom. Just lovely! Stopping by from the Creative Bloggers Hop. I love trees. I actually am doing a mini quilt with aspen trees. But when I saw this I knew immeditately I was going to do this too. My kids are growing up. Having done all sorts of crafts with handprints when they were little but now 2 of my children will be leaving home in the next 3 months. 1 to the Navy, and one off to finish his degree. Getting their handprints one more time will be special. Thanks for the great reminder! Thanks for sharing the step-by-step! This is so beautiful and creative...I'm ready to go and see what I can find in the kids closets that need some recycling....Thank you! I love this idea! I featured it over at hoo's got talent! Thanks for linking up to the party! I LOVE this!! Will have to do this IMMEDITATELY, now if only I can get the 21 month old to let me trace her hand. They are always trying to do that in nursery at church and she always runs away. Thanks again for this great idea! I loved your Bubble container idea so much I posted it on my blog with a link back to you, of course. SO very cute... I can't wait to try this with my kids... even if I do the quick version on paper!!! Also, thanks for the tutorial on the wrapped canvas...MUST TRY!!! I love this craft! You should follow my blog http://quickthinkmom.blogspot.com/ it's about inexpensive craft and food ideas for kids. Hi there! I just wanted you to know that I did make Grandma gifts completely inspired by your cherry blossom trees. Thanks so much for the inspiration!! I love this and i think i hve found something for our bedroom bare walls.. I love this idea and added it to my Pin board. 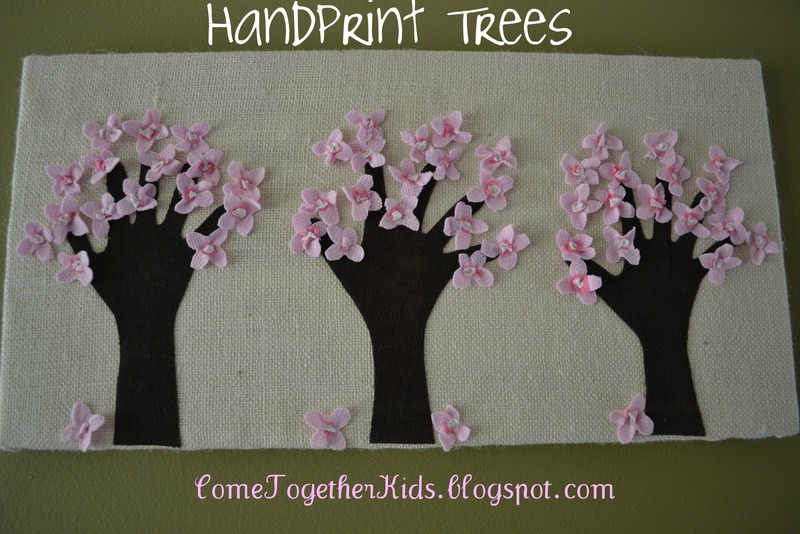 I LOVE these-they are so cute & I want to make them with my kiddos, perhaps for the grandparents? I wanted to let you know I have featured this on Stay At Home Nation, so please stop by & check it out! While you're there, I would love for you to link up to My Favorite Things Friday Party(going on all week). I can't wait to see what you share! I made this using my Cameo and cutting out the flowers in a light pink velum. I found some nice patterned pink paper for the centers and it looks fab. My 3 year old painted the canvas a nice blue and we cut out the hand with a textured brown. Also included a heart with her name and each of her grandmas - made 4 for all the elders. Can't wait for their reactions. I LOVE this! I am so going to use this for a special family project! My husband and I are adopting a 14 year old girl, I think this would be such a great project to do and have hang in her room, I might cut out a quote that says something like "family forever" or "together forever" I'm sure I will find something! But what a great way to remember when she comes to stay with her forever family! :) Thank you so much for sharing this! This was the perfect inspiration for my sisters 40th Birthday gift. It is fall now, so my kids made Fimo clay leaves out of fall colors and we hot glued them onto there "hands". I also had a light blue and dark blue burlap canvas aswell as the taupe color. so I sewed them in 3 sections for a sky look. I found a really fun qoute too that we printed out on tranfer paper and ironed onto the bottom of the canvas before we stretched it onto the frame. It turned out awesome!!! Thanks for your great idea!